I blinked. Twice. Scratched my head. Till it hurt. Twirled my ponytail. Pulled my lips. Huh? What was I looking at? I felt as if I was falling through a void with nowhere to grab onto and no point of reference to orient myself. And I wasn’t contemplating some abstract piece of art with deep and profound ideas hidden within the subtleties and subtext of the canvas. Nope. I was supposed to be looking at an ad—a motivational ad?—that I’m assuming meant to make me want to join a gym. A specific gym. Yet all it made me want to was hurl into my own hands. And not because I hate working out. I LOVE working out. I still for the life of me can’t figure this ad out. Something? Something what? Shallowness? Frivolity? Money? Is that supposed to be a representation of me on the couch? Or something I aspire to? What? It’s not funny. It’s not ironic. Not even a little bit. What is it? 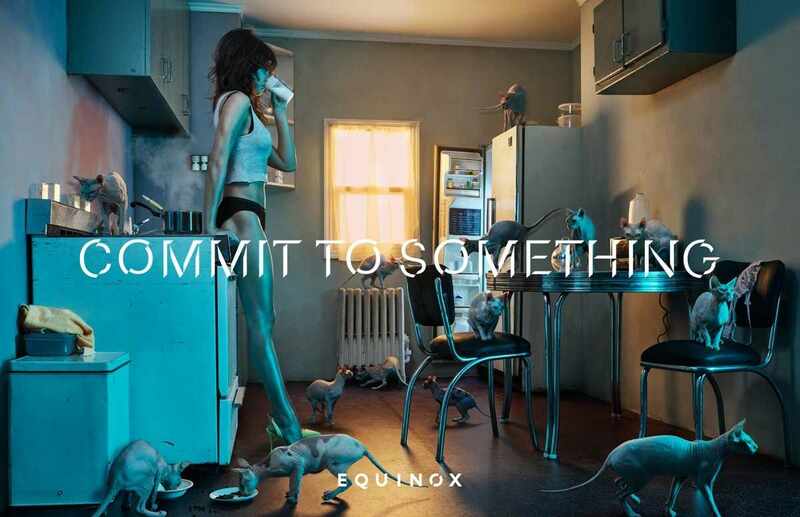 What do any of the ads in this Equinox campaign mean anyway? What does any of this have to do with commitment? Which circles back to Equinox and to getting me to work out, how? When talented people write badly it’s generally for one of two reason: Either they’re blinded by an idea they feel compelled to prove or they’re driven by an emotion they must express. When talented people write well, it is generally for this reason: They’re moved by a desire to touch an audience. And his advice holds true for communicators in general, be they marketers, copywriters, web designers, film directors. 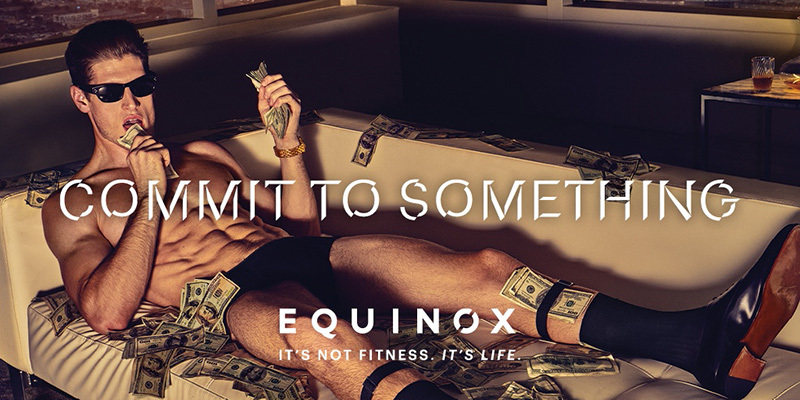 Was equinox really trying to touch an audience here? And which audience would that be? It seems to me that they got carried away in their quest to become “creative” with the idea of commitment. To prove they could take a creative stance on commitment. They got so eager to express something about commitment that they totally lost the audience’s worldview in the process. And worldview is the most direct means of connecting to an audience. A while back, I spent a year living in Argentina. A week or so after my arrival, I decided to go running in one of the marvelous parks of Buenos Aires. Then I met up with a new friend for lunch. Friend: What did you do today? Me: No one. Just me. Friend: You went running on your own? Me: Ummm, yeees… why is that dangerous around here? Friend: Dangerous? No. It’s weird. Friend: Who runs on their own? It’s so boring! Friend: On your own?!? That’s so weird! As I quickly discovered, Argentinians turn everything into a group sport. But going running or exercising on your own? What sort of weird does that? Now imagine, if I were trying to motivate Argentinian people to take up running and created a campaign that featured lone, determined runners and talked about headspace and time to yourself. They’d be scratching their heads harder than I was scratching mine with the equinox campaign. Who runs on their own? Understand your audience’s worldview around your product or service and meet them THERE. Don’t violate it! Does your audience think interior design is hard? You can’t just tell them “No, it’s easy.” You need to meet them there. And then show them how to do it. Does your audience think that running is a group sport? Meet them there. Is your audience afraid of commitment? Or do they think commitment is a noble thing? But don’t confuse them with baffling representations of questionable commitment. Are you trying to get them to commit or to run away screaming? 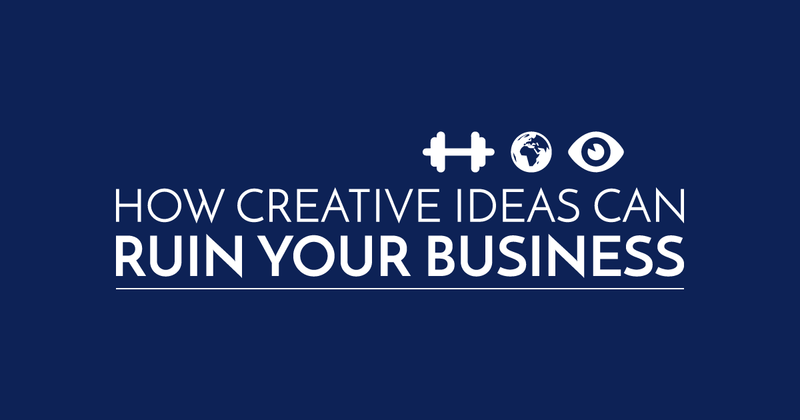 Why You Need to BE Creative but Never APPEAR Creative. And David Ogilvy was one of the greatly creative people of our times. But there’s a huge difference between being creative with your process when you craft a piece of communication and appearing creative through the final result. Being creative, on the other hand, required an empathetic look of your audience so you can place yourself into their worldview and meet them where they are so as to best touch them through meaningful communication. True creativity doesn’t break with reality. True creativity masterfully hides its own traces within the folds of the audience’s worldview. Don’t baffle your audience. Inspire them! They’ll love you much more for it! Have you seen any baffling ads lately? Or have any experiences where your worldview was violated and left you feeling entirely lost?